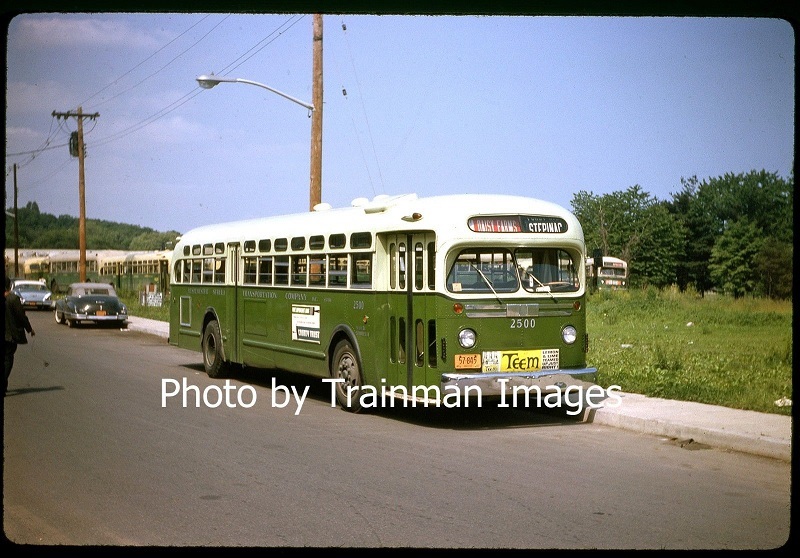 Review the following photos of Yellow Coach/GM TD-5501/TD-5401 bus number 2500 and see how this bus evolved to the last image before its destruction in a garage fire in 1968 in Westchester. b) On route 15 at Madison Square heading north on Fifth Avenue towards Jackson Heights. Note the black out lights. 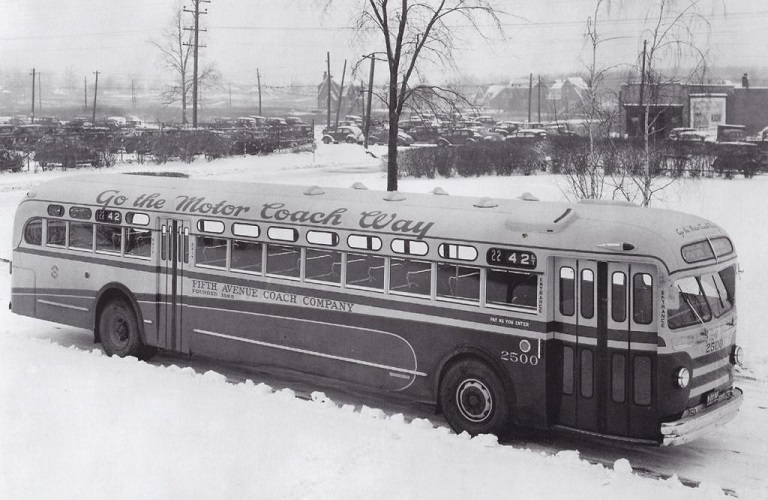 d) Now lettered for Chicago Motor Coach for its demo tour in the windy city before heading to Pontiac for rebuilding. e) Back home! Rebuilt one window shorter and on its home streets of Jackson Heights. Note the new paint scheme and sporting a GM emblem. f) Serving as a demo for the New York City's Board of Transportation (in FACCo colors). They would order 400 TDH 5101s. h) WST on route F. Note the driver's vent sealed shut. Where the final changes performed by Fifth Avenue Coach before the bus was transferred to Westchester or where they done at Westchester?? After being rebuild and shorten, 2500 became the only 40 foot GM old look without paired windows! 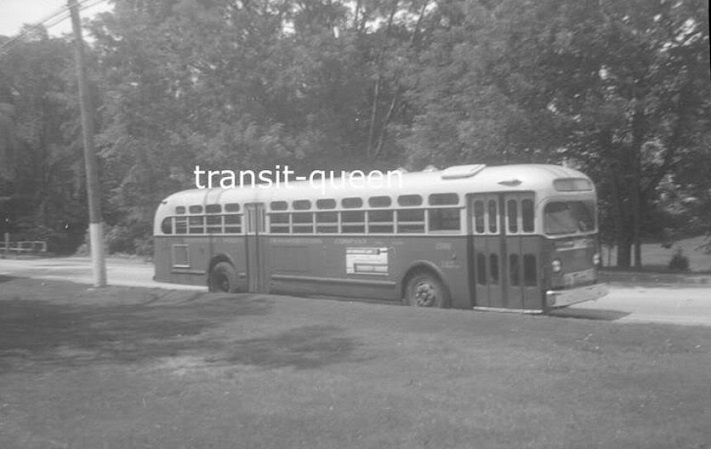 Great progressive chronicle of the life of a significant bus! Heavy duty diesel buses of that era were incredibly robust and tended to live long lives. 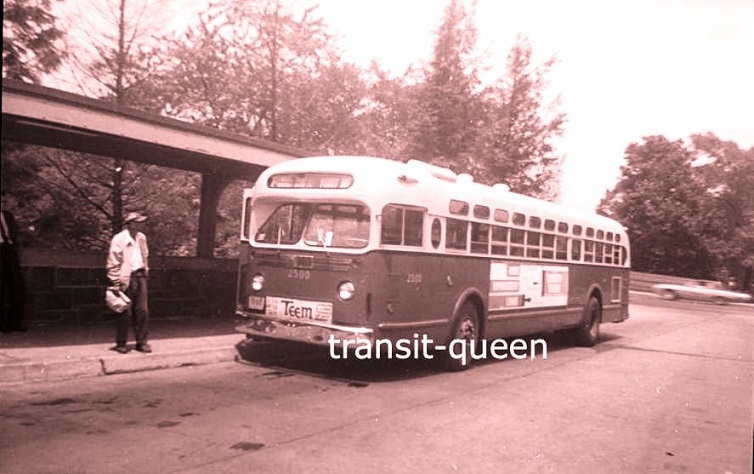 Perhaps one could make a case that maneuverability problems with such a long bus ultimately paved the way for artics to take over high density routes. It's a shame that this bus wasn't saved. Anyone know about its disposition? 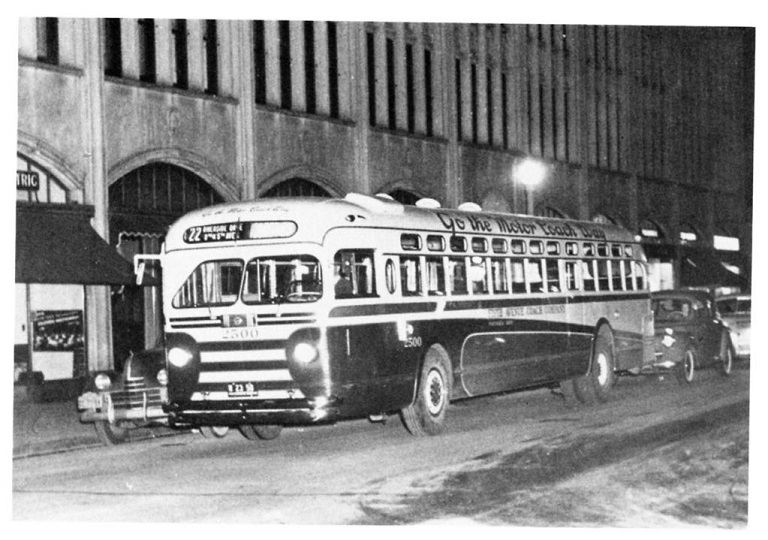 This bus was unfortunately destroyed in a garage fire in 1968 at the White Plains garage of Westchester Street Transportation. "The new service will be a variation of the route now operating from 168th Street and Broadway to Washington Square and will be known as Route No. 22. It will run from 168th Street and Broadway, via Riverside Drive, Seventy-second Street, Broadway and Columbus Circle to Eighth Avenue and along that thoroughfare to Pennsylvania Station. At Thirtieth Street the route will cross to Fifth Avenue and thence to Washington Square." It was likely gone by the time World War II got started. Besides its being twice the fare as on affiliated entity Eighth Avenue Coach Corporation's 10 - Eighth Avenue and Central Park West line which also stopped there. 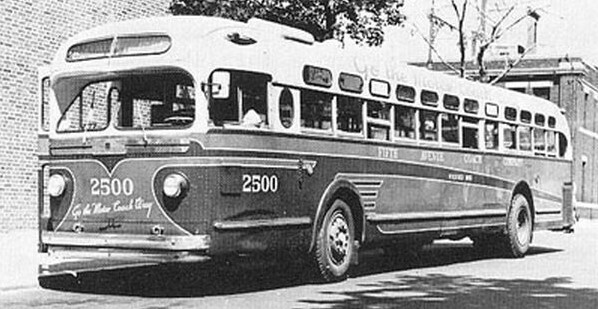 This is the final scheme applied to #2500 while in service for Westchester Street Transportation. In 1968 it was destroyed in a garage fire. 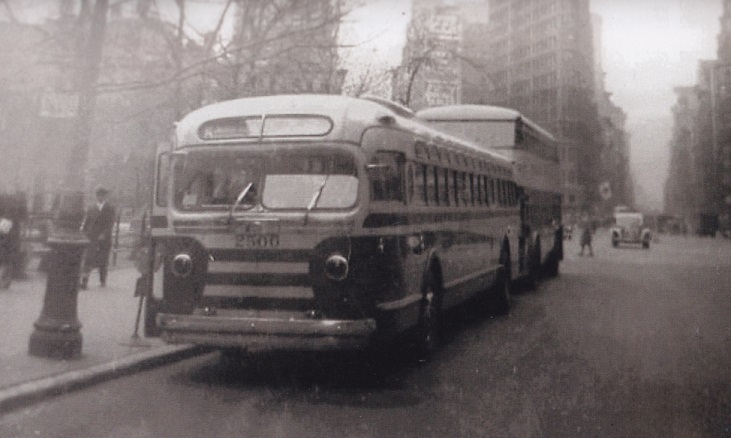 As I asked in the original thread, was the rebuilding with recessed headlights, wide chrome bumper and school bus like passenger windows (split sash), and a larger GM logo in the wings (but missing from the bus but you can see the four rivets that held it in place) done at WST or did it come like that from Fifth Avenue Coach?? This slide was recently sold on EBay and it is used here for educational purposes. 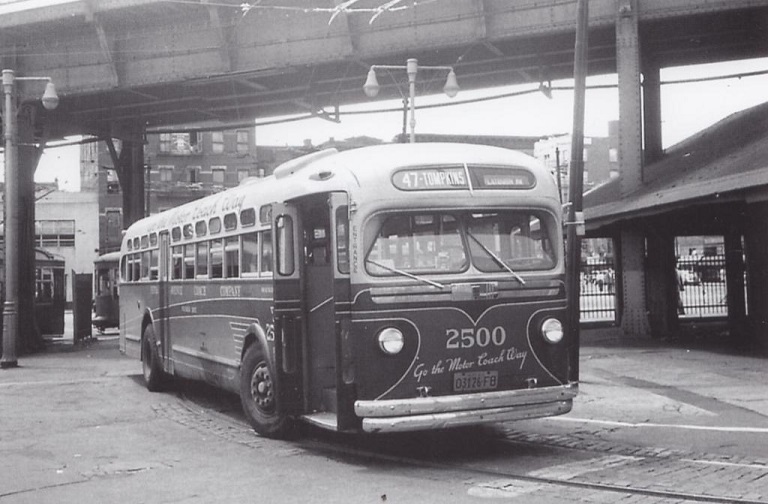 Anyone sure further mods weren't done by GM between the 1962 strike that ended FACL's (and Surface Transit's) operations of Manhattan and Bronx bus routes, and 2500's being spirited away to Westchester for its last six years? But then, I do remember FACCo used to build their own buses before Omnibus got its mitts onto the company. 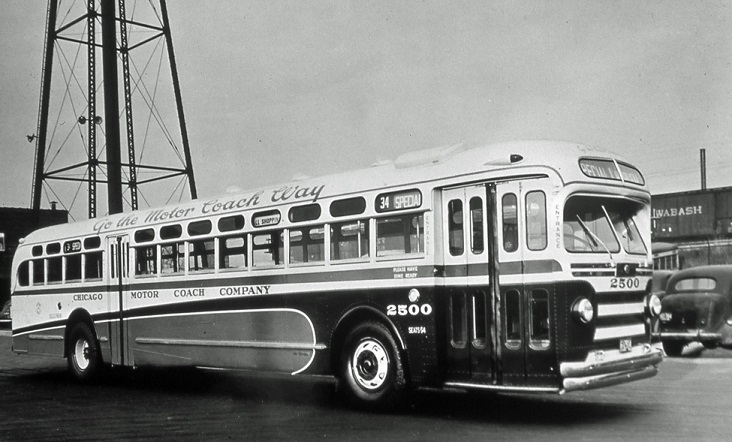 Are there any 1956-62 pics of 2500 after the flagging on the sides was changed to 'FIFTH AVENUE COACH LINES INC.'? That might also be a clue when those split window sashes first turned up.